Kids Fishing Registration Form HERE. Volunteers are needed to help register kids, distribute tackle, repair tackle and help kids catch fish. Report to the Clear Lake Resort at 7 AM. Additional volunteers will be needed from 2 PM to 4 PM to clean up and take down the fish net pens. 1. Travel on I-90 westbound approximately 16 miles. 2. Take Exit 264 (Salnave Road/WA-902). 3. Turn Right onto Salnave Road/WA-902. 4. Take the 1st Right (immediate) onto S. Clear Lake Road. 5. Travel approximately 1 mile on S. Clear Lake Road and the Fairchild AFB Recreation Area will be on the left. The 2019 GORDON STEINMETZ MEMORIAL SPRING WALLEYE CLASSIC will be hosted & launched from Coulee Playland Resort in Electric City. Tournament updates will be available in early 2019. The US Coast Guard Auxiliary will speak at our May meeting on boating safety and also conduct boat safety inspections for interested members at that meeting . Spokane Walleye Club has NO June meeting. Meet at 7 AM at Nine Mile Resort on Long Lake (Spokane Lake). Discover Pass Required. $7 boat launch fee. The Spokane Walleye Club has tentative plans to have a club fish day at Lake Pend Oreille on Saturday, August 10th. More details will be posted when a boat launch for this event has been determined. Our Fall Camp Out will be held at the Snake River in 2019. Free camping is available (no water or electric hookups) at the Texas Rapids Corps of Engineers campground. Additional camping options are available at the Lyons Ferry KOA where water and electric hookups are available. Take Hwy 261 south for 55 miles. NOTE!!! To remain on Hwy 261, you must turn left approximately 7 miles south of Washtucna. A half mile before reaching Starbuck, turn left onto Little Goose Dam Road. 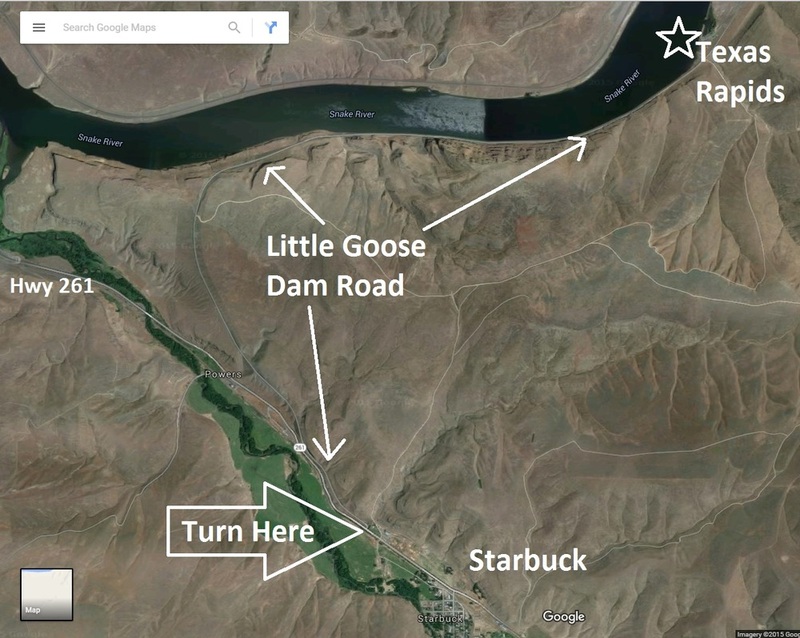 Follow Little Goose Dam Road for approximately 6 miles to Texas Rapids Campground. A group will meet at Yoke’s in Airway Heights at 730 AM. We plan to launch at Northrop boat launch around 9 AM. A group of us will meet at Yoke’s in Airway Heights at 7 AM and we will drive to the launch at Seven Bays Marina. Lake Roosevelt boat launch fee of $8. It takes dozens of volunteers to assemble fishing rods for the Kids Fishing event at Clear Lake. Join us at the Inland Northwest Council building at 600 PM to prepare hundreds of fishing poles for this special event. Bring a pliers and a pair of scissors. Our guest speakers will be Aaron and Kyle from Mark’s Marine. They will discuss the capability of Lowrance fish finders and how to get the most out of this technology. General Membership meetings are held the last Wed of the month at the Inland Northwest Wildlife Council. 6116 N Market St, Spokane, WA 99208 Our guest speaker will be Mike Wilkinson from invasive species. Open to Public. A short business meeting including election of board members will be followed by a guest speaker. Club Meetings are held at the Inland Northwest Wildlife Council at 6116 North Market Street, Spokane WA. Our annual Awards Banquet will be held at Timber Creek Buffet at 1:00 PM on Sunday, December 2nd. We don't catch a lot of walleye on the Snake River, but we often catch some of the biggest fish of the year during the fall at this Club Fish Day. Richard Gamba from the Federal Wildlife Service will be our guest speaker. The Fall Camp Out returns to Fort Spokane this year. We have reserved the group campsite for Thursday afternoon through Monday morning. Our annual fishing competition runs from 830 am to 1 pm on Saturday (weather dependent). The weekend features a potluck lunch around 2 pm on Saturday and our potluck breakfast will be Sunday morning around 9 am. Mark's Marine will be hosting the Mercury Training Truck on Saturday the 25th, demonstrating all the latest in the new V6 and V8 Mercury motors. It's a good opportunity to learn with us about all these exciting new motors from the Experts at Mercury who helped put them together. A group of us will meet at Yoke's in Airway Heights around 7 AM. We will aim to launch around 8 AM at Ft Spokane on Lake Roosevelt. Remain on Hwy 25 for 21 miles until you reach the Ft Spokane campground/boat launch. Open to Public. Our guest speaker will be Kent Mayer from WDFW. He will bring the findings of the 2017 Fall Walleye Index Netting (FWIN) surveys. Let's meet at the Nine Mile Resort at 830 AM. Boat launch fee is $7. A Discovery Pass is required since the resort and campground are part of Riverside State Park. Mark's Marine spring fishing seminar series will feature Greg Koch of the Spokane Walleye Club. He will discuss several basic techniques for catching walleyes in the Inland Northwest. Our March Meeting will be held at 7 PM at the Inland Northwest Wildlife Council on 6116 North Market Street in Spokane. Trudeau's Marina will be our guest speaker. Trudeau recently became the Inland Northwest's Crestliner Boat Dealer. Cabela's Great Outdoor Days 2 will feature seminars on hunting, fishing, and other outdoor pursuits. At 1 PM, Spokane Walleye Club member Greg Koch will present his seminar, "Walleye Structure: Locating Fish Through the Seasons." Cabela's Great Outdoor Days will feature seminars on hunting, fishing, and other outdoor pursuits. At noon, Spokane Walleye Club member Greg Koch will present his seminar, "The Washington Walleye Calendar: The Best Walleye Waters for Each Month of the Year." Spokane Walleye Club members Greg Koch and Travis Sholten will present a four part walleye seminar series at Cabela's during the month of February. Seminars will be held each Thursday evening at 630 PM at the Cabela's in Post Falls. Devils Lake North Dakota pro angler Johnnie Candle will be teaching walleye techniques in Kennewick WA on Feb 17th. During this one day event you will discover fish catching patterns, cutting edge techniques, how to better understand your marine electronics, and find out what is new in walleye gear. There will be an extensive Q and A session so bring plenty of questions and make this your personalized walleye seminar. Registration is required. Cost of the class is $50. Lunch is included. A tackle package provided by Berkley, Mack's Lures, and Yakima Baits will be given to each attendee. Register by calling Griggs in Kennewick, WA at 509-547-0566 or Ranch and Home in Kennewick, WA at 509-737-1996.